Visit Hanging Bridges, La Fortuna Waterfall, National Park, & Hot Springs! This 4-in-1 tour is a perfect excursion for all those looking to see and do as much as possible in one day. You start your day when you are picked up from your hotel and driven to the Arenal rainforest hanging bridges. Here your guide will take you on a 2.5-hour walk along 16 hanging bridges over a two-mile trail, where you can get in close contact with the flora and fauna found in the Costa Rican rainforests. Then on to the amazing La Fortuna Waterfall at the base of the dormant volcano Cerro Chato. A 20-minute hike and you’re down at the foot of the 230-foot (70-meter) high La Fortuna waterfall. Here you can swim in the natural pool. Enjoy a well-deserved lunch before heading on to Arenal Volcano National Park. 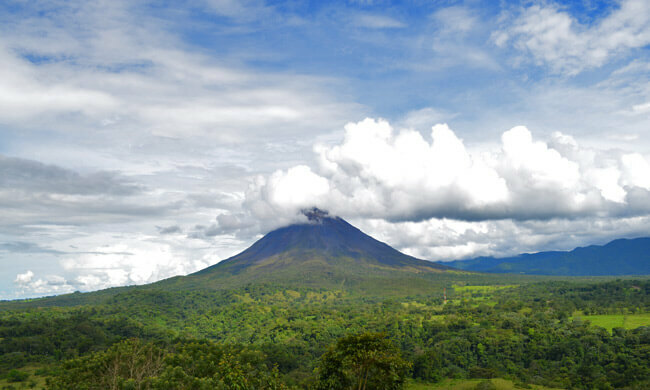 Arenal Volcano erupted on a daily basis between 1968 and up until recently in 2010 when it entered a quiet phase. On your two-mile hike you will learn all about the natural history of the area. There are opportunities to spot animals like monkeys and birds, as well as various plant species. Finally head to the luxurious Tabacon thermal hot springs. These springs are completely natural and the most luxurious in the area, with 25 pools varying in temperatures from 77º F to 122º F. Thermal hot springs are famous for their therapeutic benefits since ancient times. Soaking in the pools found throughout Tabacon’s lush rainforest garden will stress and tension in both the body and the mind whilst detoxifying the skin. After the springs, enjoy a wonderful meal at Tabacon’s restaurant featuring international cuisine. Then head back to your hotel with amazing memories of your day of adventure in Arenal! Notice: You should be in physically good condition, as the tour includes 7-8 hours of walking and is an almost 13-hour day in total. Your tour includes: Transportation from/to your hotel, entrance fees, bilingual guide, lunch, dinner.